"Test Environment Management:Using Services & Tools for Best Practices"
Why is it significant to properly manage test environments? How should we do it? What are the best practices and strategies to use test environment management tools and services? Test environment management strategy involves guiding and managing the test environment hardware, software, databases, applications, and test data. Slowed testing and inconsistent results are caused by poorly managed environments while problematic, testing issues are caused by inadequate test data management. A dedicated Test Environment Management (TEM) team. Defining the team terminology and sticking to it. Creating an easily accessible knowledge base. 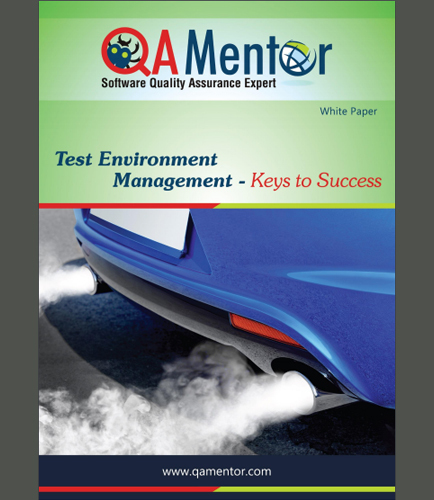 Defining the test environment strategy. Improving efficiency and productivity in testing. Test management tools that can assist the TEM. Download this whitepaper to build a stronger, better managed test environment which brings a reduction in production issues, increased productivity, and higher customer satisfaction rates.